The emergent properties of my system ‘Resilience’ are not covered by words like ‘donations’, so to call it ‘decentralized taxation’ is the most accurate metaphor I’ve found. The idea of ‘crypto basic income’ as part of a decentralized organization is frequently heard around the blockchain space, and that’s a hard problem. The Resilience system solves it through the use of a ‘pay-it-forward’ mechanism, so that each step in a supply chain contributes the same amount. The result is something that could not be labeled ‘donations’, it’s something new. The Resilience system is built to produce emergent effects from smaller parts, and mimics how nature achieves that through the use of evolutionary algorithms. The system introduces units of replication that are called Taxemes. 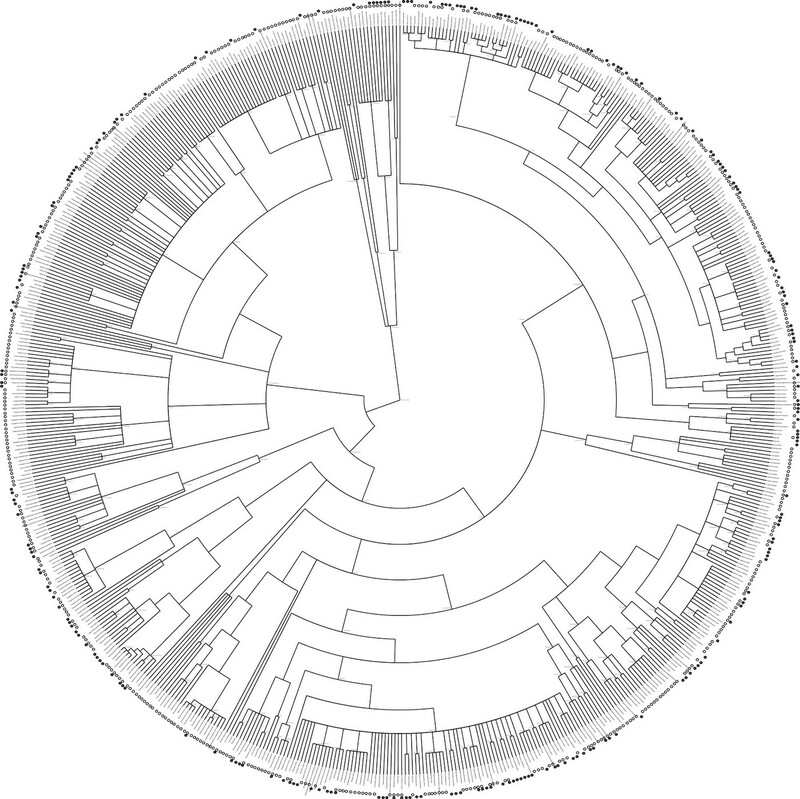 Taxemes are based on the principles of variation, selection, and heredity. 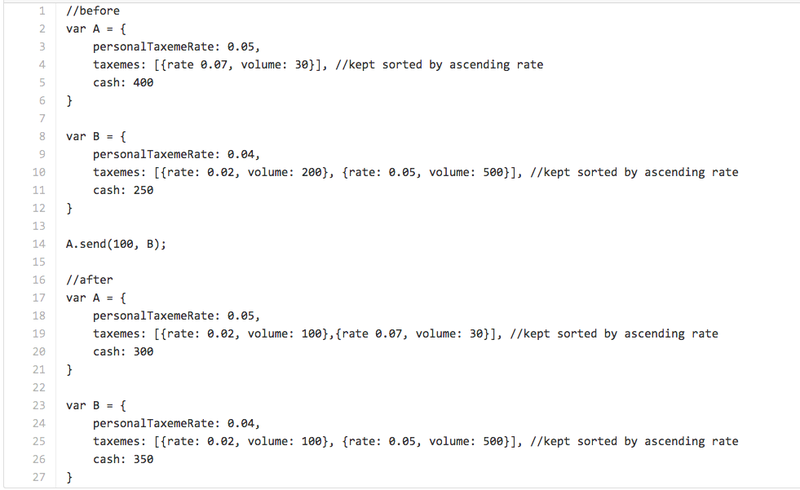 Variation is achieved from each node hosting their own personal Taxeme, of which they can adjust the tax-rate at any time. Selection is achieved by designing the framework such that consumers will come to prefer Taxemes at certain tax-rates. Heredity is achieved by inheriting Taxemes upon transaction, and passing them forward down supply chains and from producer to consumer, and employee to employer. Selection is incentivized by the rule of lowest first. Each node may host an infinite number of Taxemes at any given time, but the lowest one is favored always, and described as active or dominant. Upon making a transaction, a dividend pathway is formed that gains a width proportional to the Taxeme that was active during the transaction. These dividend pathways are similar to blood-vessels in that wider pathways have higher throughput for the money that has been collected by Taxemes. Those who grow wide dividend pathways will compete for more universal basic income, incentivizing consumers to be part of the selection of Taxemes. The growth-patterns of dividend pathways shape how Taxemes spread, and influence what rates will become popular, and the demography of their transmission pathways. They are designed such that they mirror how we are inter-connected financially around the world, and they discover patterns of inter-dependence that have been overlooked in the past. The growth of dividend pathways is based on a path-finding algorithm that was pioneered by RipplePay in 2003, and the system traces how nodes contribute value to one another, and how new value builds on previously created value. 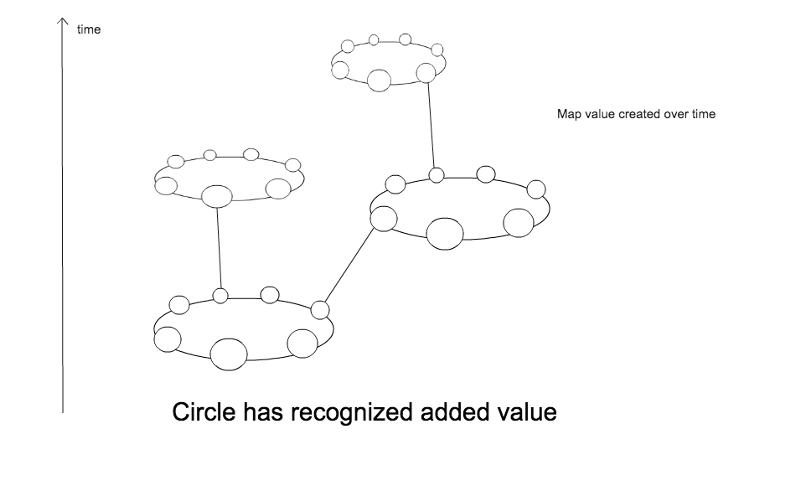 The visualization below shows how each circle that the path-finding algorithm renders branches out into new circles, that in turn branch out into new circles, each new circle made possible by the value added by the previous. As Taxemes collect money, they send it into the dividend pathways down-streams of the node that was taxed, and the tax flows to all nodes within that fractal web of pathways, and is absorbed in small amounts by each node along the way, like nutrients in a vascular system. The growth of dividend pathways is future oriented, you only receive tax from pathways that extend away from you later in time. This removes the incentive to consume from producers that have already built up large dividend pathway grids, as you only gain access to pathways that grow upwards from your consumption trail. This design influences the behavior of Taxemes, the predictability of how a specific Taxeme will spread, and the economic gains and costs of inheriting a specific Taxeme. Dividend pathways are organic in the sense that they grow and wither naturally. They get used up and decay as basic income flows through them. You might grow thousands of pathways in one place, and then if you move somewhere else, you´ll create new pathways while your old ones gradually fade. Taxemes are removed from circulation using mechanics that mimic biological immune systems and anti-bodies. 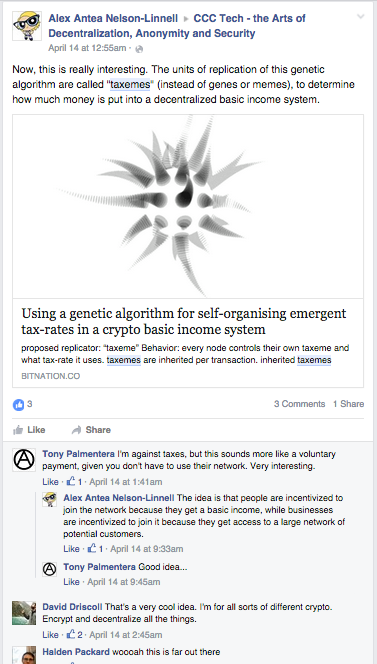 When a new Taxeme is originated, through a node consuming from a node whose active Taxeme is its personal taxeme, anti-taxemes are also created and set to destruct the originated taxeme when they collide. These anti-taxemes spread in the reverse direction, from consumer to producer, and they are seeded in vast amounts, so that a collapse is mathematically pre-determined. I’ll leave you with a vision of why I want to deploy a decentralized basic income system, and why I’ve invented what I call wealth sharing. My dream is a world where ideas spread through mate choice, and where everyone is free to be their true self. My Resilience is the end of statism, and will do for neural information – memes – what the TCP/IP protocols did for digital information, and create resilience at the level of ideas. I think it is too complex…. above you say that your dream is ¨ a world where ideas spread through mate choice, and where everyone is free to be their true self¨. But to achieve that you just have to really know yourself, know your needs (or wants) and consciously share them on a ¨ Commons Market Platform¨….. I have an idea that may include your the pathways and Taxemes concept (I would have to check with you if I understood it properly) , please send me an email and let us talk by phone…. 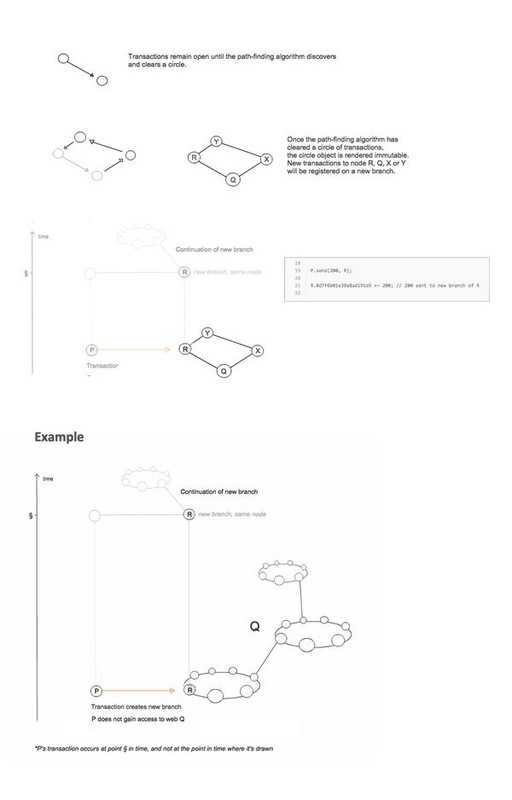 Dear Johan, pls include a numeric step by step example of how the money flows over a simple network.